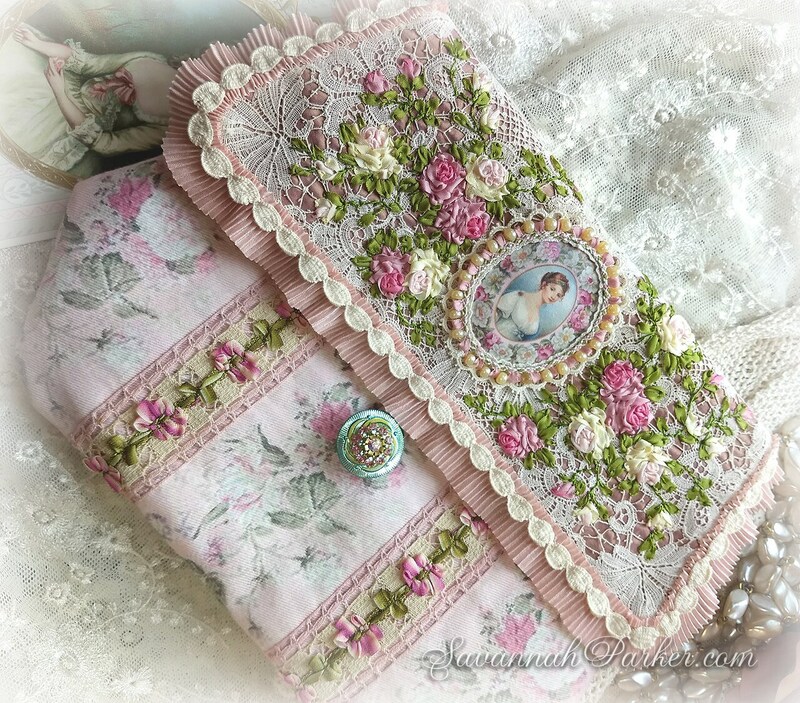 Antique Style Victorian Edwardian Romantic Queen Marie Louise Silk Ribbonwork Embroidery and Antique Lace envelope-style clutch purse handbag ......another of my fabulous antique-inspired, totally romantic original bags/purses---previous ones have sold out super-quickly so am planning a whole new group of new ones, all with exquisite silk ribbon embroidery! 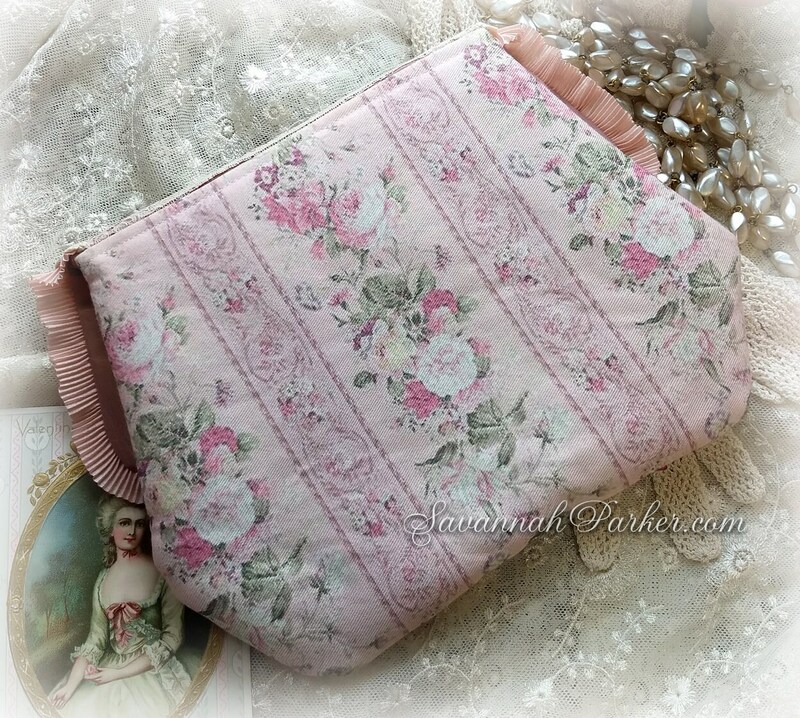 This ONE OF A KIND (and ready to ship immediately!) 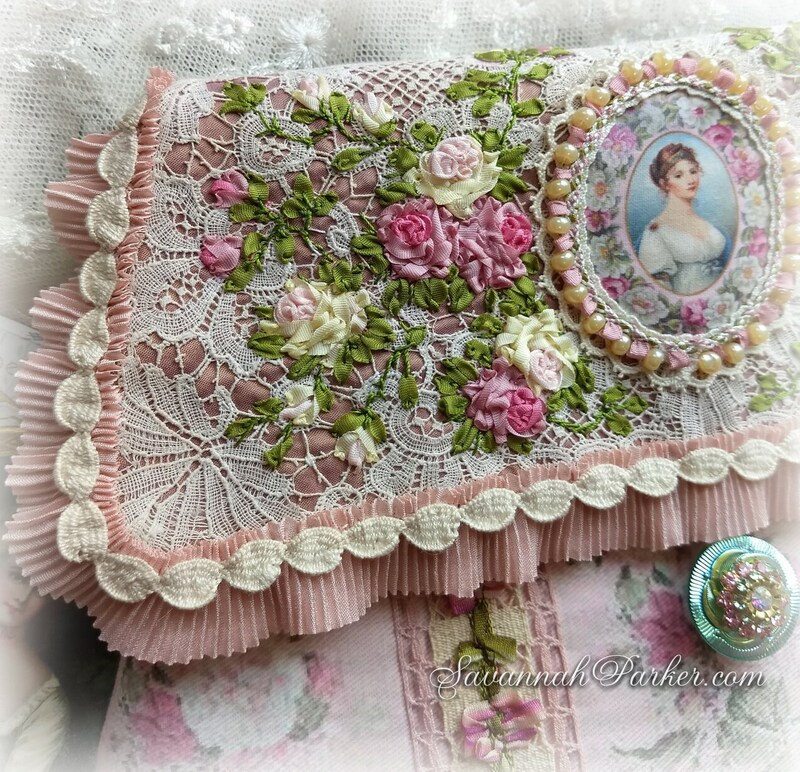 beauty is lavished with tons of antique laces and trims in different designs and types, as well as delicate and intricate hand embroidered silk ribbon roses, buds and leaves. 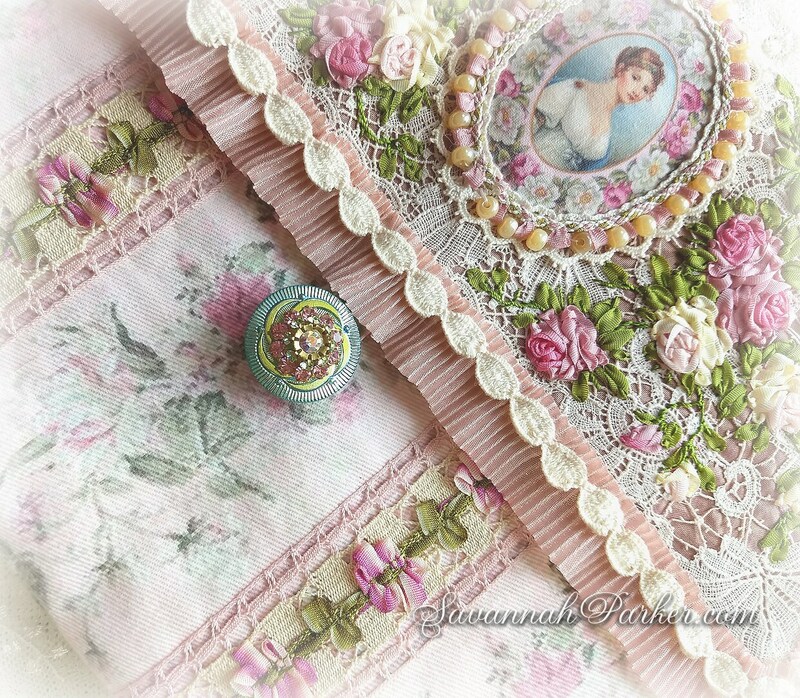 I decided to design my own very antique-inspired pieces that incorporate some of the exquisite laces, trims & materials in my never ending stash, with elegant, precise & clean rather than "tattered" details....you won't find any raw edges or haphazardly tacked-on doilies here, only the fabulous vintage elements and fine-couture quality finishing that is the standard for all my creations. 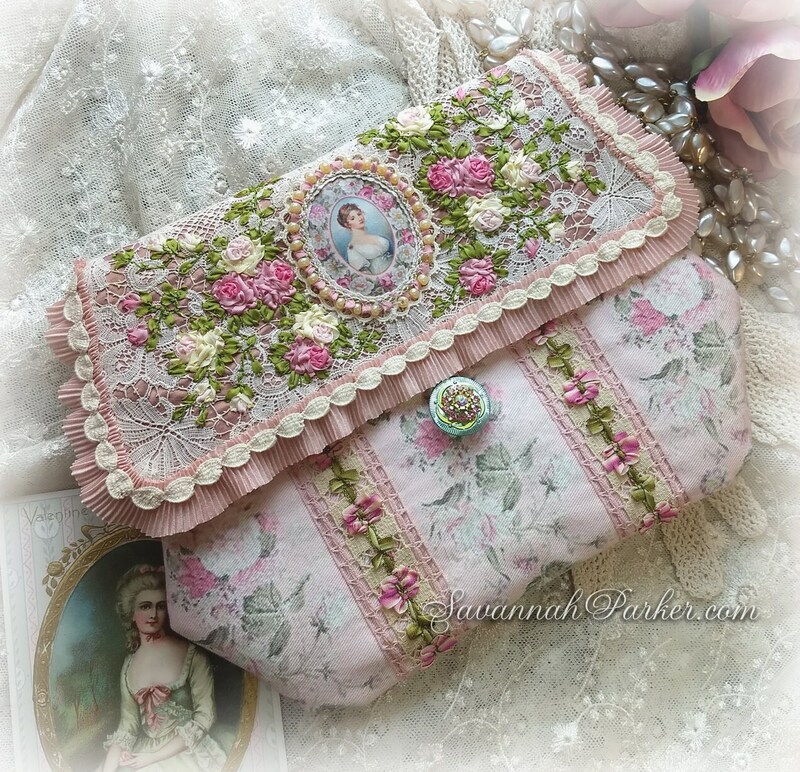 This incredible, one of a kind piece with a nostalgic rococo roses-and-lace theme was inspired by my love of antique Victorian, Edwardian and 1920's fashions and the delicate, beautiful beaded and jeweled bags that were made to accompany those styles....The body of this bag, which is an rounded envelope/clutch-style, is of beautiful custom-printed pink floral cotton twill layered over a light weight foundation to hold its shape; the deep foldover flap is overlaid with a front panel of extraordinarily fine antique lace, pearl glass bead trim, delicate pleated silk ruffling, rococo ribbon trim, and silk picot loop edging; all framing the centerpiece around which I've hand embroidered very extensive groupings of exquisite, delicate silk ribbonwork roses in ivory/pale pink and vivid pinks with green silk foliage...In the center of this extraordinary purse is a vintage print of French Queen/Empress Marie Louise (second wife of Napoleon), bordered by antique lace and pink silk picot loop edging, as well as ivory glass pearl beads. 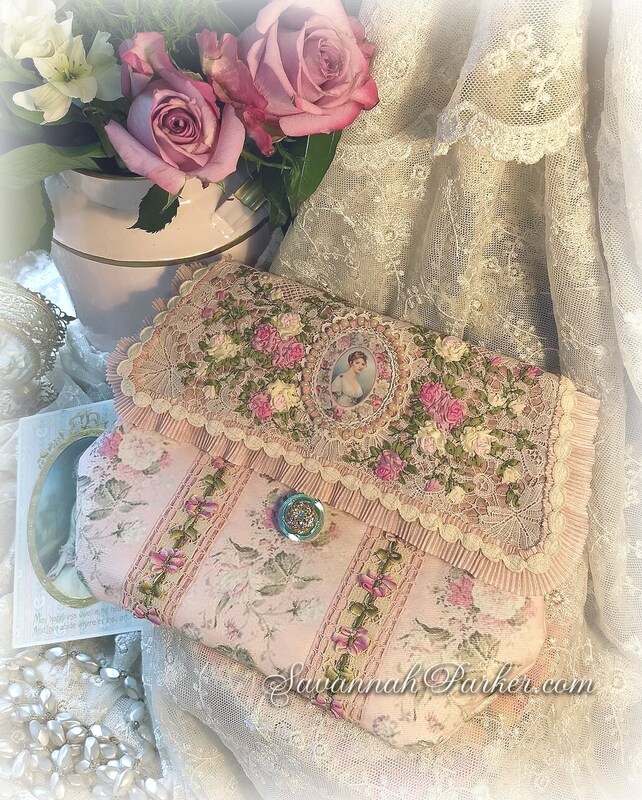 All of this is worked upon a layer of exquisite and extremely fine antique lace with the most delicate of patterns, which is in turn layered over iridescent dusty rose silk taffeta. 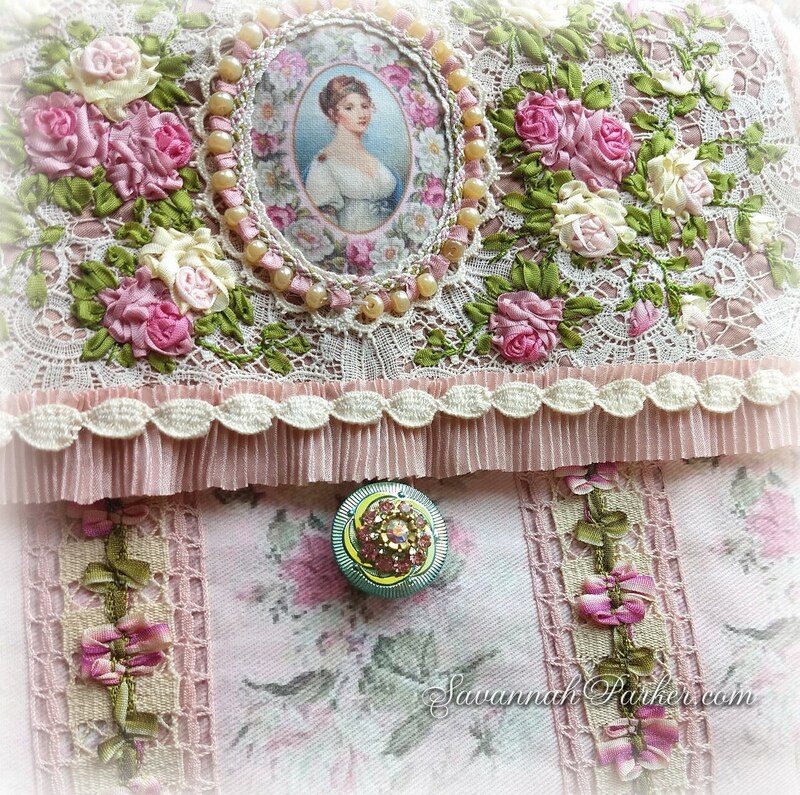 Around the edge of the top flap I've added the most delicate, beautiful tiny-pleated pink silk ruffling layered with antique ecru scalloped trim. 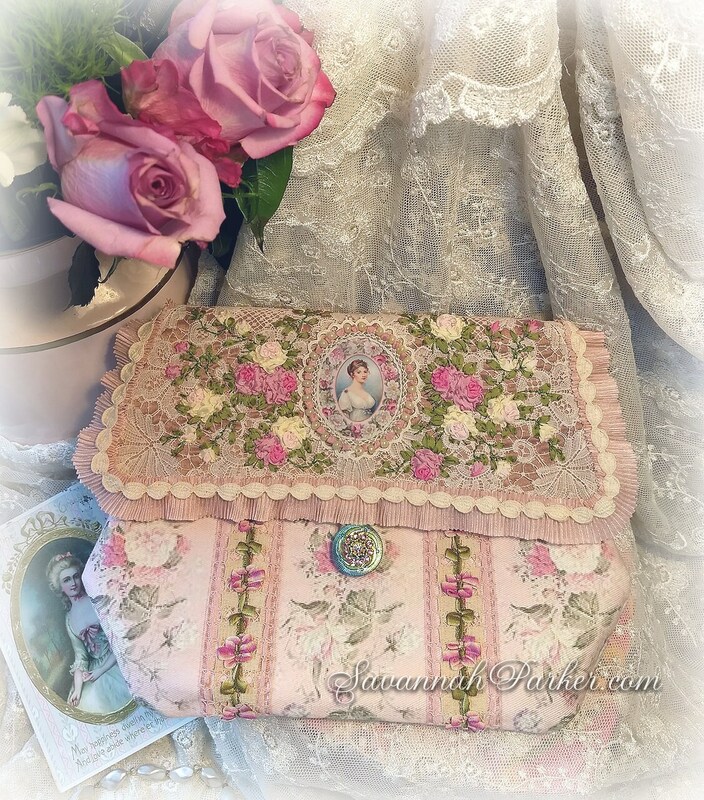 Two rows of wide ecru and pink antique lace are handsewn on the front main body of the bag, topped by two rows of fine vintage rose and green rococo ribbonwork trim that echoes the colors of the hand embroidered roses above. Perfect size for the essentials: eyeglasses or cell phone, compact, keys, and a lipstick or two---measurements of this beauty are approx. 9.5" by 7.5", a very nice and comfortable size and not too small to hold all the necessities. 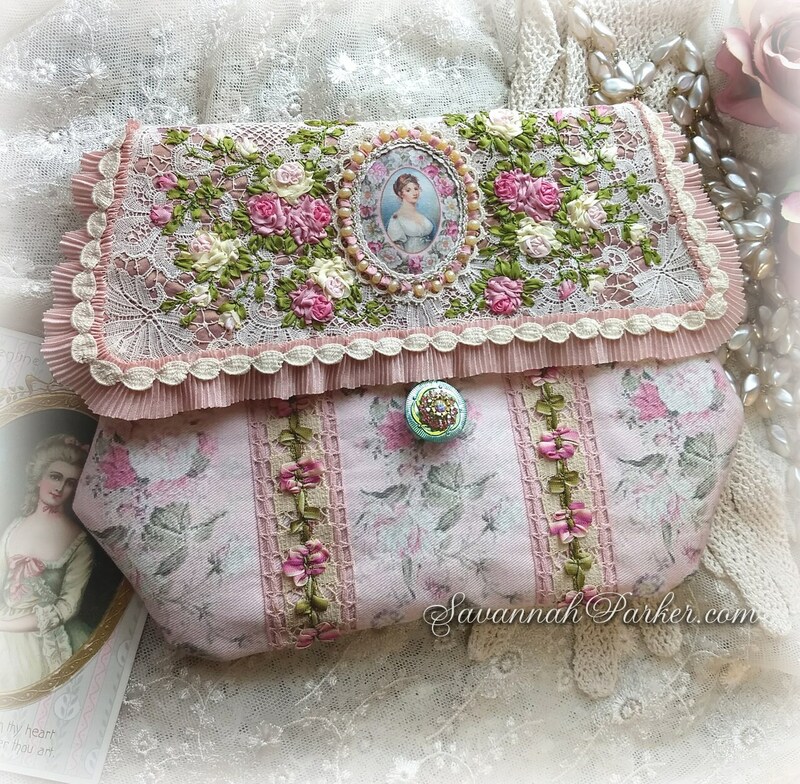 Fabulous gift for a special person and a wonderful evening or wedding bag, or even just a gorgeous display piece! 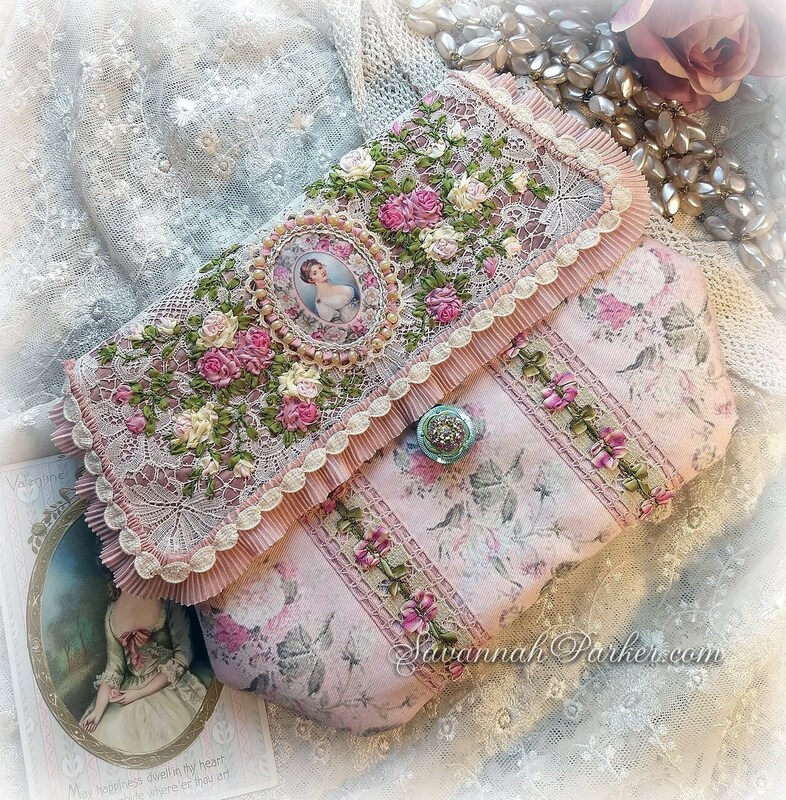 Do check my other listings for more bags and purses coming up very soon, as well as my very popular antique-style hats, clothing, jeweled frames & fabulous jewelry, with antique/vintage custom-dressed dolls coming very soon.....I try to list new items at least weekly....always a great selection of handmade vintage and antique inspired beauties including the gorgeous coordinating jewelry for the total vintage look. Thanks for visiting!